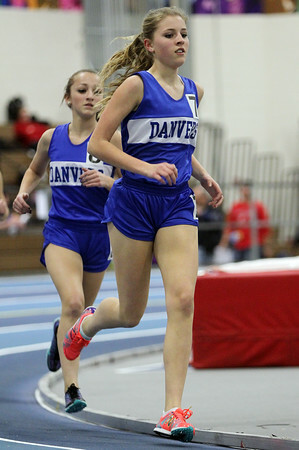 Danvers sophomore Katie Crum, right, and freshman teammate Becky Henion, left, run in the girls mile at the NEC Conference Meet at the Reggie Lewis Center in Roxbury on Friday afternoon. DAVID LE/Staff photo. 1/30/15.